Jude breaks every law in the comedic gem, Dom Hemingway. After a 25 year career of mostly dramatic portrayals, Jude Law redefines his standard screen persona with a movie that totally changes how people will see him. The highly profane, blisteringly violent, and drunkenly brash character of Dom Hemingway is nothing short of comedic genius with a reinvigorated Law at the helm: drinking, screwing and bloodily bashing his way to new personal heights as an actor. 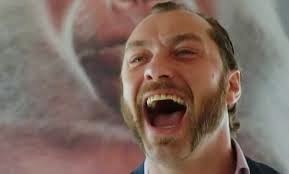 If there was ever any question in your mind, Dom Hemingway is the movie that proves Jude Law is a dynamic star/actor that can take on the persona of a reprehensible character and churn it out with a morally ambivalent wink and a dirty, whisky infused smile. This is the Jude Law we've been waiting for. This is Jude Law as the kind of character we always knew he could pull off but never had the large cojones to try. Dom Hemingway is a raunch infused film about a man released from a 12 year stint in prison who is on a sexually charged mission to destroy himself and everything around him, all the while making sure everyone knows his name. Dom Hemingway is a laugh out loud character that doesn't understand the implications of his actions or the fine line between good and evil. Dom is an unlikable man that never puts down the liquor and quite honestly never stops digging himself a deeper hole. Yet, the movie is one of the best comedies I've seen this year. It's a satirical play on all the gangsters and evil men we've grown to love over the years, with a hilarious story to boot. This is the departure Jude Law has needed for years. 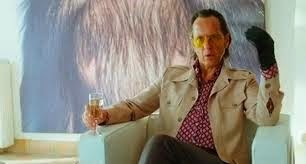 Maybe the movie isn't perfect, often times becoming a little too snide for its own good, but Dom Hemingway feels like a Guy Ritchie movie birthed of a humorous nature mixed with a little Chopper Read and an eclectic supporting cast that features Demian Bichir and Richard E. Grant. If you can stand a little blood mixed with your drinks, Dom Hemingway is the movie for you especially if you like laugh out loud British humor, an actor at the peak of his artistic career and stories about visceral people on the wrong side of the law.